I found this old devotion that I wrote back in the 2nd year of our prayer group, probably in the fall of 2014. Being that we are closing in on Black Friday, I thought I would republish this blog all over again for that much needed reminder about the craziness of Christmas shopping. “Do not store up for yourselves treasures on earth, where moths and vermin destroy, and where thieves break in and steal. But store up for yourselves treasures in heaven, where moths and vermin do not destroy, and where thieves do not break in and steal. For where your treasure is, there your heart will be also” (Matthew 6: 19-21, NIV). “And my God will meet all your needs according to the riches of his glory in Christ Jesus” (Philippians 4: 19, NIV). “For the love of money is a root of all kinds of evil. Some people, eager for money, have wandered from the faith and pierced themselves with many griefs” (1 Timothy 6: 10, NIV). Devotion: Black Friday. The two words go together this year like peanut butter and jelly. I used to think there was a negative connotation to the word. After all, black was symbolic of evil in my mind. Then my wife told me the phrase originated from a term I had actually never heard coined before. To be “in the black” meant that you’re ahead. I still didn’t believe her. There had to be something about that word black that was negative, something evil or just plain wrong. When one of my third hour students asked me if I was going to go Black Friday shopping, I quickly responded back with just the right amount of annoyance in my tone of voice, “No, I’d rather spend that time with my family.” Crickets. She ducked her head in shame. Point me! Driving home from my folks’ house on Thanksgiving night, we saw them. The Black Friday shoppers were ready to storm the gates. They were lined up outside like a bunch of teenage girls getting ready to have the first shot at One Direction tickets. The line snaked out of the doors and around the building like a serpent. I drove home not worried so much about finding the perfect deal on a gift but more about which bedtime book I would read my two little ones. 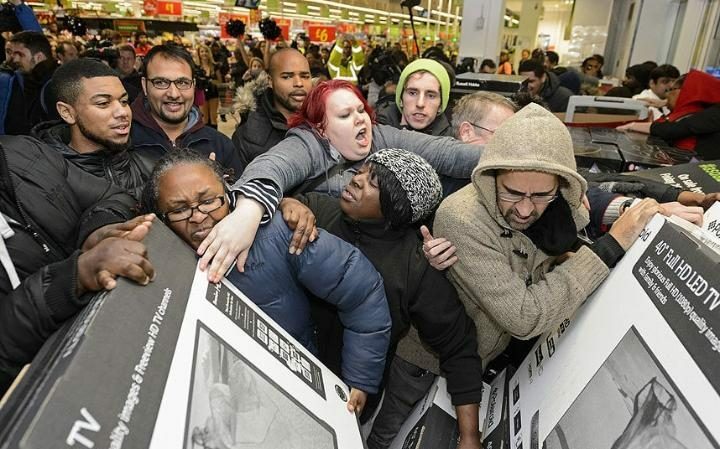 Later I found a clip online of a Black Friday rush toward a store. Sheesh! Reminds me of Braveheart, the Scotsmen charging the field of battle! Freeeeeeeddddddooooooooooooooooooooom!!! Don’t get me wrong. I’m not saying if you have gone Black Friday shopping that you are sinning. My relatives in Florida head out every year, and they are Christian as they come. They love deals! So do I, but I just am not that gung-ho about them. I mean, seriously, think about this question. Do you want your kids’ memories of Thanksgiving to be of you scarfing down a quick dinner so you’re first in line at Best Buy? Whatever happened to enjoying a nice long, leisurely Thanksgiving meal, bonding with family, and going for that second slice of pie since you had pumpkin to begin with and wanted to make sure that pecan was just as good (I am not speaking from experience there … not at all … okay, yes, that was me). If you’re so caught up on getting a deal, maybe it is time to evaluate your money management. Are you craving that deal like my dogs crave my boys’ scraps of food because you like deals or because you are in the red? I wonder about some of those people. When have our motives been driven more by money and less about family? Materialism is the typical pit we fall into this time of year, especially when buying gifts for those we love. But I’m doing this for my family? Is that what you rationalize this with? Is that why you’re fighting 30 degree temperatures, wind whipping your face, as you huddle up with a now lukewarm cup of coffee that you had hoped would last much longer, looking like you’re in line to get a crack at KU vs. K-State basketball tickets? If you need a deal THAT bad, I wonder if you’re saving enough. I wonder how your IRA is looking. Are you taking too many unneeded trips to get that triple Frappuccino mocha latte? Excuse me as I abuse every single one of those words—is there even such a thing? I have no clue. My normal Starbuck’s special is a medium blonde coffee with cream; if I’m crazy I’ll go hazelnut. Eating out too much? Do you buy always buy name brand clothing? Are you buying to keep up with the neighbors across the street? Be careful with that credit card. My sons actually like Dora, so they are fond of using that “Swiper, no swiping” line. I could probably make some money on creating a talking credit card that would say that every time you spent over your monthly budget amount. Oops! Did I just say it? I did! The “B” word. You’ve stopped reading now. Got to get you back quick! How about watching a Black Friday video? Pretty serious stuff here. The sad thing is that some of these people despise that B word worse than the outcome of that video. Why create a budget when you can get deals like this, cheat people out of money, borrow money and never give it back, or just gain money illegally? I do believe it was the Notorious BIG that was once quoted as stating “Mo Money Mo Problems.” Advice from a rapper? Have I gone insane? Take a financial planning class. My wife and I did way back in the first year of our marriage. One of the best decisions of our lives. Get on track. Snowball your debt! Trust that God will provide for you. Matthew 6: 25 states, “Therefore I tell you, do not worry about your life, what you will eat or drink; or about your body, what you will wear. Is not life more than food, and the body more than clothes?” Just a bit of truth to chew on before we get too far into the holiday season. And even Biggy can’t top that piece of advice. Rank yourself on a scale of one to ten. How well do you manage your money? What is most difficult for you in terms of managing your money? Do you spend too feverously? Try to keep up with the Jones’? Not save enough? Don’t plan ahead enough? Too much credit card swiping? Write a specific goal for yourself below in how you would like to tackle your biggest problem above. Challenge: Keep tally of every penny you spend for one month. Write it down on an Excel document at the end of each day. And I’m talking every penny here, down to the last coffee at Starbucks! At the end of the month, see how much money you have spent. To take this further, find out your monthly expenses, and subtract them out of your take home pay. Based on this information, create a budget.